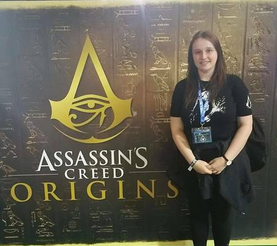 Last year, we released an edition guide for Assassin's Creed Origins, which helped Community Members who were about to pre-order the game. The edition guide returns, this time breaking down the various versions of Assassin's Creed Odyssey! ​Let us know if you found this guide useful. Assassin's Creed Odyssey releases worldwide October 5th 2018. 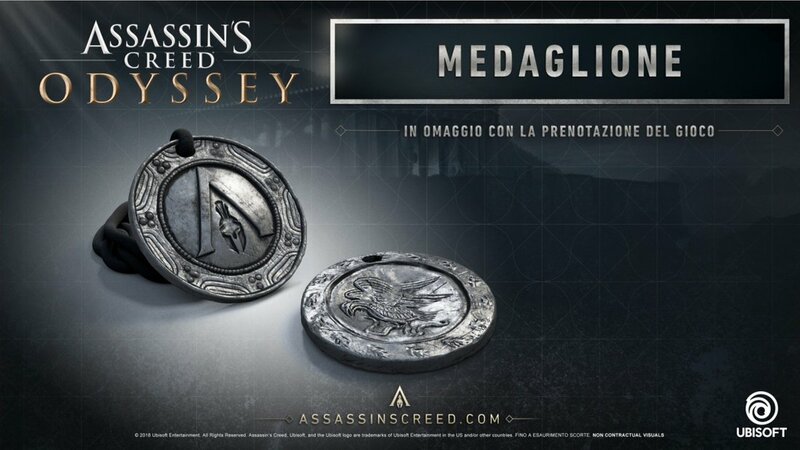 ​Gamelife Italia are giving away Assassin's Creed Odyssey Medallions as a pre-order bonus! EARLY ACCESS + SEASON PASS + STEELBOOK - Get game three days early, all story content with the Season Pass, and steelbook. EARLY ACCESS + ALL-IN-ONE PACKAGE - Get the game three days early, receive powerful gear, and continue your odyssey with the Season Pass. The 64 page game’s Art Book: Featuring the artworks from Ubisoft Quebec artists that led to the creation of the game. The Selected Game Soundtrack: A selection of the best music of Assassin’s Creed® Odyssey. EARLY ACCESS + SEASON PASS + STEELBOOK Get game three days early, all story content with the Season Pass, and steelbook. Early access starting on October 2. 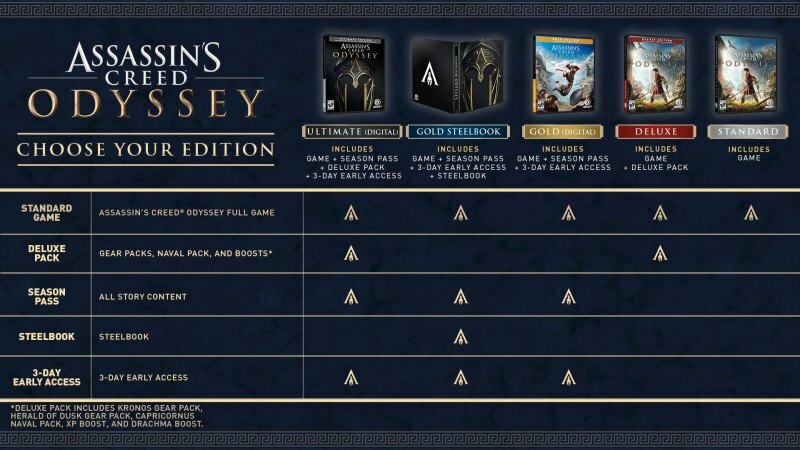 Assassin’s Creed® Odyssey Gold Edition and additional digital content including: the Deluxe Edition Pack, the Season Pass, which will give players access to all upcoming major expansions, as well as the additional mission The Blind King. The Assassin’s Creed® Odyssey Steelbook™. A 64-page art book featuring the original designs and concept art from the Ubisoft Quebec artists. 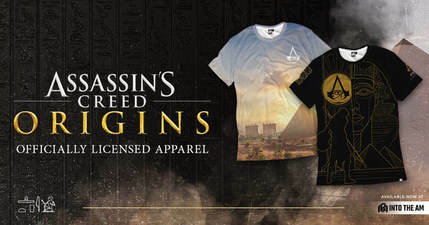 An exclusive lithograph by Hugo Puzzuoli from Ubisoft Quebec. By Ubicollectibles : Two statues forming The Nemesis Diorama (height 39.5cm, width 65cm). 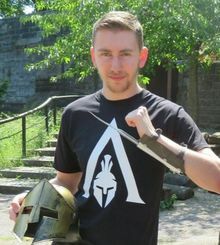 How can I get to play Assassin’s Creed: Odyssey earlier than the standard release date (05/10/2018)? 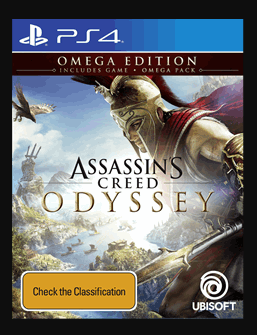 - Or purchase a new copy of Assassin’s Creed® Odyssey DIGITAL ULTIMATE EDITION or DIGITAL GOLD EDITION at participating retailers* from 02/10/2018 – 00:01 am to 04/10/2018 – 23:59 pm. - Your game will be available to play once the play early period begins on 02/10/2018 – 00:01 am.